Congressman, 1887-1889; U.S. Senator, 1901-1931; Chairman of Finance, World War I. Birthplace is one-tenth mile. Born near Pollocksville in Jones County on land where his family had lived since the early 1700s, Simmons graduated from Trinity College in 1873, at which point he moved first to Goldsboro and then to New Bern to commence the practice of law. In 1908 he purchased an imposing house on Front Street in New Bern where he lived until his death. 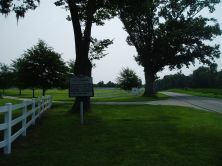 The municipal airport in New Bern is named in honor of the Senator and of young pilot Benjamin Nott, killed in a crash in 1931. Simmons served in the United States House of Representatives from 1887 to 1889 but lost his bid for reelection to Henry P. Cheatham, an African American. His accrued power as the chairman of the Democratic state executive committee in 1892, a post he also held from 1898 to 1907. As the head of the party Simmons in large part engineered the white supremacy campaigns of 1898 and 1900. 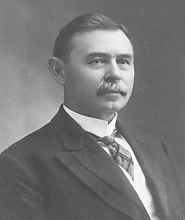 President Grover Cleveland appointed him collector of internal revenue for the eastern district of North Carolina, 1893-1897. 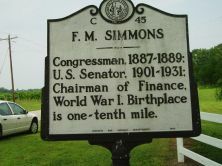 In the Senate Simmons chaired the Finance Committee, 1913-1919, during the Woodrow Wilson administration. He was largely responsible for the creation of Fort Bragg during World War I and for the construction of the Intracoastal Waterway. In 1928 he drew national attention for his outspoken opposition to the presidential candidacy of Democrat Alfred E. Smith of New York, favoring the bid of Herbert Hoover. For his betrayal of the party he was defeated in the Democratic primary in 1930. William S. Powell, ed., Dictionary of North Carolina Biography, V, 346-347—sketch by Richard L. Watson Jr.